The city of Guelph – situated just 100 km west of Toronto, Ontario Canada – is home to over 120,000 people. It’s a fast-growing city; its water supply, however, isn’t. For its water supply, the city only depends on groundwater. This dependency on groundwater leaves the city low on water supply specifically during summer months and droughts. 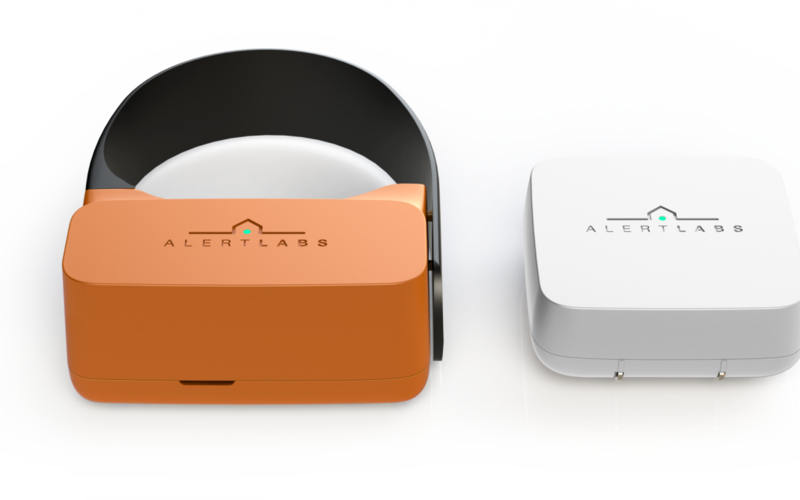 Alert Labs responded to the water challenge by offering its Flowie water sensor and Floodie companion sensor – water sensors that send real-time alerts to a customer’s smartphone for emergencies like floods or leaks. In September 2016, Alert Labs won the city of Guelph’s water challenge with its conservation tech: Flowie water sensor and Floodie companion sensor. The Flowie water sensor takes real-time readings from standard residential and commercial water meters. This water sensor can simply be installed in just 2 minutes by strapping it onto the water meter. It automatically connects to the cellular network. No need for a wi-fi connection. The sensor sends to your computer, tablet or smartphone real-time monitoring of water consumption, analyzes trends and reports valuable analytics. The Floodie companion sensor, meanwhile, sends you alerts to your computer, tablet or smartphone whenever it comes in contact with water. The city of Guelph has the Flowie Water Sensor Rebate program which covers the Flowie water sensor and Floodie companion sensor. Alert Labs, the maker of Flowie water sensor and Floodie companion sensor, gives a $50 instant rebate for Guelph residents who install water sensors for their homes or businesses. The city of Guelph installed the Flowie water sensor at the city’s Sleeman Centre and the West End Recreational Centre. According to Mathew Newman, Water Services technician of the city of Guelph and an expert in investigating high water use issues with homeowners and businesses, when they strapped the Flowie water sensor onto the water meter of the Sleeman Centre, the sensor and data it provided gave the city “a lot of opportunities to show where we can save water and make the systems a bit more efficient”. Newman similarly found that when they strapped the Flowie water sensor onto the water meter of the West End Recreational Centre, they were able to establish when exactly is the water peak demand, when exactly Zambonis are filled, when swimming pools are filled and when showers are used. By getting a clear diagnostic of what is being used, the city was able “to find ways to improve efficiency”, Newman said. According to Newman, it’s not the only city government of Guelph that saves money as a result of using smart water sensor, but the city’s residents as well. He said one day, the owners of a local restaurant complained to the city’s Water Services about the sudden increase of the restaurant’s water bill. When the Flowie water sensor was strapped onto the municipal water meter of the restaurant, the positive impact was almost immediate, Newman said. “It was clear as soon as we strapped it on that water was running constantly 24 /7, all throughout the night and all throughout the day,” he said. He said that the minute-by-minute water data sent by the Flowie water sensor suggested a major leak. Further investigation by the city’s Water Services revealed a broken valve on the restaurant’s noisy ice machine, which resulted in 24/7 running of water into the ice machine and literally down the drain. When the broken valve on the ice machine was fixed, Newman said that the restaurant saved $630 per month in water costs. According to Newman, water issues in homes are caused 95% of the time by a malfunctioning toilet or a malfunctioning water softener. “It really only takes one incident like a toilet flapper sticking or a water softener malfunctioning for the Flowie to pay for itself,” he said. For your home, you can strap the Flowie water sensor onto your municipal water meter, while the companion flood sensor can be placed under or near flood-risk areas, such as hot water toilets, heaters, laundry areas, sinks, dishwashers and garages. You can install these two conservation devices by yourself in just 2 minutes without the need of technical knowledge or tools. Unlike other smart devices that need to be connected to a wi-fi, these two devices connect to the internet without the need of a wi-fi. The Flowie sensor doesn’t just give you minute-by-minute status of your water system, power system and heating and cooling system. It also provides you with data analytics – giving you daily and monthly average water consumption, basement temperature versus outdoor temperature and many more. To receive minute-by-minute information from the Flowie sensor, as well as data analytics, you need to install the Alert Labs app on your computer or mobile phone. The web and mobile dashboards of the Alert Labs app provide you with instant visibility of the different status of a number of sensors placed in different locations or properties. This visibility is ideal if you’re a property manager or a landlord.